We can't give you a quote from Godwin Matenga Man and Van Services, but we have hundreds of drivers waiting to offer you a great price. Have a question for Godwin Matenga Man and Van Services? No problem, send them a message and they'll email you back as soon as possible. If you have a more general question you might find it answered in the FAQ, or you always contact one of our brilliant customer service team. * Godwin Matenga Man and Van Services won't be able to see your email address. Exciting Man and Van Services available in your area. 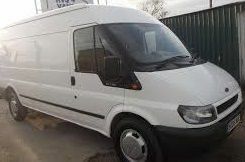 Experience one of the best man and van removal services. A helpful and friendly service for stress free removals. Godwin was fantastic. He was abit late due to traffic, but he called to let me know. He was so helpful, respectful and very strong. His Van is also big and managed to fit all my stuff in and could have even fit more. Book Godwin, you wont be disappointed, i'm sure he is the best! Amazing service. Ended up finished packing up a lot earlier than expected and my driver was flexible and allowed me to change the time. Very polite and helped me pack my items into the van. Great experience, very friendly and chatty which was nice, helped us with everything from our flat to the storage unit. Will book again in a few weeks! Very good service and very helping driver. Highly recommend his services. Godwin is a star and very professional, I would mostly definitely use him again and recommend him to others. Anyone looking for a man and van you need look no further, Thank you once again for everything. Godwyn was a great guy, really helpful, strong and intelligent. You cannot go wrong with him. I thought he was helpful and clearly experienced. Made the whole thing very easy. Easiest move I e ever had. Despite the fact I didn't have much stuff my driver was very helpful and very polite. Highly recommend. Godwin was great. He made the whole experience run smoothly and way less stressful than I was imagining it to be. The journey to the new place was enjoyable and we had a good laugh talking to him. I would def recommend him to anyone as his van is actually quite large and he is very helpful. Godwin was lovely... waited whilst we sorted access to student halls and was really helpful. The van arrival being slightly delayed by heavy traffic was no worry at all when the person that arrived was so lovely, helpful and efficient. Very grateful indeed that a stressful move was made so much easier. Great service! Had to wait longer than expected to get keys to new place, but was happy to extend the booking. Really helpful loading & unloading. Godwin is an absolute angel...with amazing strength! We couldn't have done our move in such a quick time without his help. He had us, the van and the journey organised impeccably. Like previous reviews, his music choice is fantastic and I really enjoyed our discussions on the way to our final destination; he is a very interesting man. Do not look for anyone else - book him for any move you need to make!!! Godwin was excellent - very friendly , incredible workrate and his van was great too. Highly recommended! Thanks for the help Godwin! Godwin was excellent throughout. On time, careful and very helpful. Made the move super easy and was a pleasure to talk to through the London Friday traffic. Couldn't recommend him highly enough. Safe driver and no issues. Thanks again! Godwin was a godsend. He was incredibly helpful and went beyond what I would have expected in collecting goods from a DIY store even going to a different store when the first store failed to get the order ready. Top class service. Friendly, good music during the drive between locations, and very helpful with re-assembly. Highly recommend. The driver was really really extremely kind!!!! We booked the van for 2 hours but we have taken 3 hrs, he didn't complain about anything or asked for more money (of course we gave him money for using the extra hours). We opted for no driver help, but still he helped us moving our furnitures and boxes. Godwin was excellent he went above and beyond and was professional throughout. Excellent driver. I greatly recommend him to anyone. Very kind man who catered to our every need! will definitely recommend and use again! He was excellent! So efficient. We were done packing and unpacking in my new home in an hour! And we had a lot of stuff, all going to a first floor flat, so lots of stairs to climb too. Would definitely use him again! I would recommend to all. The driver was great and very helpful. He definately knew what he was doing and how to handle moving our things. The van was great size for what we had and was also clean in and out! He came early and he was very nice and helpful. Would definitely recommend him as it was excellent service. Will definitely recommend him and if I need to I will use that driver again, he's a very pleasant gentleman. Fab move! Would definitely use this service again, many thanks. Brilliant drive, thanks to Godwin. The drives was very helpful! Bang on time, friendly and helped us unload everything. Would recommend. Very helpful and friendly would recommend to friends and family. It was perfect and all handled in very little time, so i highly recommend! Godwin was great: fast, friendly and efficient. Well recommended! Godwin was super helpful and generally took the stress out of the already stressful move! Thank you so much. I will be recommending you to family, friends and clients. Godwin Matenga was incredible. He was on time and very efficient. But most importantly, he was incredibly nice and very chatty throughout the drive. He was able to make moving a completely stress-free process. If I ever have to move again, I won't hesitate in calling Godwin. Top man. Would highly recommend. Godwin was early and brilliant. We managed to get everything done in 2 hours. I absolutely recommend him and this service. Especially given I rang on the day and they were able to accomadate me. I rang and asked if he could come earlier and he very kindly did. Great service! He was a lovely guy, funny and very helpful. We had a nice chat while we were driving to the new flat. Highly recommended!!! The original driver promised to ring back last night and did not and the new one arrived late. I have an ipad and not an iphone so I did not get your email regarding new driver/phone number. however when Godwin arrived he was very polite and helpful. First Rate - An excellent trip !!! Really helpful and very efficient. Would recommended Godwin to anyone! 5 stars!! Thanks again for all your help Godwin and making the move that much easier! Helpful and friendly, very recommended! An absolutely brilliant service. I made an error with my booking and your customer services were fantastic, they rectified my mistake and saved the day. I have already recommended your service to friends.